This is where it all begins, isn’t it? Sure, after the Buffalo Springfield broke up, Neil Young holed up with Jack Nitzche, Ry Cooder and made an overwrought and overthought self-titled debut solo album that buried what might have been good songs — only “The Loner” truly shines — with some weird production choices. Realizing that he was missing the spontaneity and the interplay of working with a band, Neil recruited guitarist Danny Whitten, bassist Billy Talbot & drummer Ralph Molina from a local psychedelic group called The Rockets, and rechristened them Crazy Horse. It was magic: the technical limitations of Talbot & Molina kept the songs simple, while Whitten & Young developed a two-guitar interplay that was less balanced than what he’d previously had with Stephen Stills — Neil was the lead guitarist, no question — but more explosive. Featuring a grungy garagey riff over a lumbering yet groovy rhythm — featuring both cowbell and handclaps — and a duel lead vocal with Danny Whitten, “Cinnamon Girl” was a great introduction to the voodoo that Neil Young and Crazy Horse could conjure in a a relatively short period of time if they so chose, as well as an introduction to their ongoing overarching ethos: feeling over proficiency, now and forever. A couple of chords going back and forth could be enough to evoke the cosmos. And that moment of evocation is on the bridge, where the (relatively) smoother harmonies for controlled vocal chaos, where Neil gets ever more excited as he’s setting up the guitar solo. About that guitar solo. While it probably wasn’t the first one-note guitar solo in the history of rock ‘n’ roll — hell, Pete Townshend at least started one on “I Can See For Miles” before showing off — it remains completely and totally unique, inspiring somebody to a just-audible-enough “hoo” after just a couple of measures, cos they’re into it so much. After the solo, they wisely shut it down — though there are live versions (check Weld) where they play the bridge a second time, because why the hell not? — with Neil closing out the songs playing some random chords, still too amped to fully shut it down. 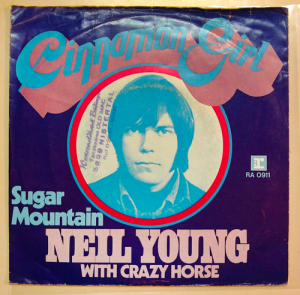 “Cinnamon Girl” feels like it might have been a hit single in 1969, but noisy guitar Neil wasn’t ever going to be a singles artist. Or quiet Neil for that matter, as he only ever had one song crack the top 30 — yup, “Heart of Gold” — outside of the context of CSNY, even though his discography shows he’s been releasing singles consistently for nearly 50 years. And even though it came out in 1969, doesn’t “Cinnamon Girl” feel like a quintessentially 1970s song? There was a lot of that going on in 1969: Abbey Road, Let it Bleed, The Velvet Underground and Led Zeppelin II all looked forward to the next decade rather than worrying about summarizing the past one, and Everybody Knows This is Nowhere was definitely part of that wave. The 1970s were right around the corner, and nobody was going to have a better decade than Neil Young.